WIND-WORKS: SheerWind-Invelox--Is the End Nigh for Another Ducted Turbine? Is the end near for SheerWind’s Invelox ducted wind turbine? The problems with SheerWind’s design are coming to a head as its signature clients lose faith. Like its predecessors in the ducted turbine sweepstakes, SheerWind arrived in a blaze of hype that their design would generate six times more electricity than a conventional wind turbine at a fraction of the cost. Yet after nearly four years of development the Minnesota startup has no successful device and no data supporting its outlandish claims. Signature clients are getting anxious or are mired in controversy. 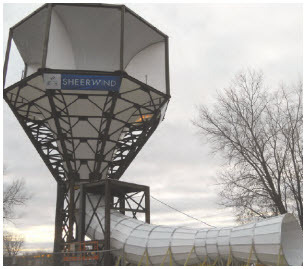 The Michigan National Guard has given SheerWind until June to get their three contracted devices in operation. Meanwhile, a SheerWind licensee has unleashed a firestorm of criticism in Denmark where one of its devices acts more like a “chimney” than a wind turbine. And 1,000 miles south of Hawaii the Nature Conservancy plans to cut consumption and add more solar on a remote atoll to make up for the failure of the Invelox device it installed with much fanfare. I’ve avoided comment on SheerWind and its Invelox device previously—I can’t really call it a wind turbine—because I’ve debunked similar claims for other devices many times before. I only mention SheerWind in passing in my 560-page book on wind energy. I include it in a litany of ducted wind turbine flops that failed to meet Carl Sagan’s skeptic’s credo that “extraordinary claims demand extraordinary proof.” In this case, SheerWind made extraordinary claims, but offered no proof that its Invelox device could do what it promised—and it still doesn’t. I wouldn’t have bothered looking into it even now until links to news articles about a furor in Denmark were thrown over my digital transom. Denmark? Surely, they know better? And that was why the flap was resonating in both the local and engineering press. Danes were asking how this could happen in the land where modern wind energy was born. Now SheerWind’s design was more than a “industry-changing” or “revolutionary” invention as such hucksters are won’t to call them. It was an international scandal involving so-called “American” technology. But before we go further, let’s look at some of the “proof” that SheerWind touts about its “game-changing” device. SheerWind reports Fielded Demos and Measured Data on their web site. This page includes a series of charts. One is of measured voltage. Yes, you read that right. They only reported voltage, not watts, nor volt-amps. These charts may look impressive to the untrained eye, but they’re meaningless. Power is volts multiplied by amps and is measured in watts or kilowatts. Energy in kilowatt-hours (kWh) is power multiplied by time. Volts are just one part of the equation. The same sleight of hand has been used in the past to impress nosy but technically illiterate journalists. Cleanfield Energy, a promoter of Vertical-Axis Wind Turbines tried to pass the same type of chart off on me about a decade ago based on wind tunnel tests. Honeywell Windtronics, another ducted wind turbine, tried something similar. Another chart shows “speed ratios” inside the duct. All well and good. Again, it’s meaningless. We’re not interested in speed ratios—or should not be. We’re interested in power or power over some unit of time—energy. This is simply more sleight of hand for the unwary. Another chart shows “energy production improvement.” This is not data collected by an internationally accredited testing laboratory, data collected according to international testing standards, or data reported in a format that is acceptable internationally. Further, the chart is purported to display how much better the Invelox device is to a conventional wind turbine. SheerWind’s chart is an estimate of what they think their device would do in a comparison with a conventional small wind turbine the same size as the rotor inside the duct. In other words, they are comparing apples to oranges. The size of the turbine in the duct is not the critical component. It is the size of the intake duct and they use a very large duct. This is a common technique among ducted turbine “inventors,” whether it’s FloDesign-Ogin, or Windtamer to show that their device is superior to conventional wind turbines. (Oddly, SheerWind includes a video of FloDesign-Ogin on their website.) Mike Barnard shredded SheerWind’s comparison in his Cleantechnia piece. Nor what testing was done was done for very long. SheerWind reports results for less than eight days. It takes months to measure the performance of a wind turbine even at a windy site. Despite years of development, SheerWind has less than eight days of data—and it’s a very limited set of data at that. World-beating technology based on eight days of data? That alone should set off alarm bells. In no place does SheerWind say exactly how much electricity was produced. They only report ratios. Wise probably. They didn’t even have the unit connected to the grid—certainly available in Minnesota. The device was connected to a load bank. For example, in my tests of small wind turbines in the Tehachapi Pass, I too used a load bank. However, I wasn’t looking for ratios. I was looking for results: power over time or kWh of generation. None of this data is found on SheerWind’s web site. Moreover, I performed my tests to the international standard for measuring wind turbine performance. SheerWind did not. Despite the hype, the laws of physics and commerce still apply. What matters are not speedup ratios but how much electricity the device generates at what cost. No one—certainly not SheerWind—can make any claim about this device on only eight days of data. It takes weeks of data in windy locations to make any kind of statistical sense of what a wind turbine will produce. In a low wind location like their site in Minnesota it would take months. Certainly, far more than eight days. To summarize, SheerWind’s web page devoted to “field data” shows nothing that makes any sense to anyone working with energy or wind energy in particular. It’s gobbledygook. Caveat emptor, buyer beware. I checked to see if SheerWind’s small turbines—the ones they’ve already installed—are certified by the Small Wind Certification Council. No they are not. Maybe they’ve applied and some of their units are in the testing phase, so I checked again. Of the 14 wind turbines that have applied to be certified in the United States none are Sheerwind. Since SheerWind’s small wind turbines are not certified—that is, they have not been tested to international standards—they do not qualify for federal tax subsidies. If you want one of these things don’t expect US taxpayers to help you out. You’re on your own. The Nature Conservancy installed one of SheerWind’s ducted devices on Palmyra Atoll in a $1.2 million project that fortunately included solar photovoltaic panels. The atoll is 1,000 miles south of Hawaii and everything on the atoll has to be shipped in. The Conservancy says they chose SheerWind’s device because of the company’s claims that it was bird safe. The atoll is a bird sanctuary. When queried further, Livingston never clarified just what “some electricity” means. Is this just volts again? Is this a few kWh? We don’t know. The Nature Conservancy is not talking. No. More likely the project was doomed from the start and all the money, effort and embarrassment could have been avoided with a little more due diligence at the start. Disclosure: I suggested on an electronic forum in August 2014 that heads should roll at the Nature Conservancy for the damaging hype they have fostered and for the donor funds they have squandered on the SheerWind-Invelox device. We should assume that this device is not operating. The flap begins with a Danish company, E-Venturi A/S, buying a “license” from SheerWind for about $500,000 to build Invelox turbines in Denmark. The scandal deepens when the municipality of Slagelse expected that one of the devices would produce hydrogen to power the city’s buses. Ingenøren reports that the municipality has no documentation on the device and now they discover that it doesn’t work. The selling point for the city was that SheerWind’s ducted device could be installed in an urban area. Ingenøren was openly skeptical of this claim. There are many conventional wind turbines installed in urban areas throughout Denmark as well as across Europe. According to Ingenøren, no one anywhere where the devices have been installed knows whether they work or not. Ingenøren asked for performance data from independent testing laboratories, a standard practice when writing about wind turbines of any type or size. No data was provided. Now city councilors want answers and it’s a full-blown political scandal. David Drachmann-Sunne of the engineering company that advised the city on the device claims that as a young technology there were no such measurements before the device was installed. In one report, an observer noted that the device was acting as a chimney instead of a funnel. Air was not flowing down through the duct but up and out the intake. E-Venturi, the Danish firm with rights to the turbine, hasn’t been able to get any answers either. They complain, says Ingenøren, that every time they ask for help with the Slagelse device, SheerWind demands more money. Sjællandske media, the local newspaper, closed one of its articles on SheerWind's device with an amusing incident that could come from a Laurel and Hardy skit. They sent Daryoush Allaei, Invelox’s inventor, a series of questions about the device. Allaei said he couldn’t answer the questions because he doesn’t speak Danish. The newspaper had sent the questions in English. . .
We can assume that this device also does not work. Like the Nature Conservancy, the Michigan National Guard is being cautious about the status of the SheerWind devices at two of its bases. The devices are “not fully functional yet,” says Brigadier General Mike Stone. In late 2014 the Guard announced that they were investing $1.5 million for SheerWind devices at two locations: Camp Grayling in the central part of the state and at Fort Custer near Kalamazoo in southern Michigan. Presently, there are two devices at Camp Grayling and one at Fort Custer. None of which are working. One device has undergone some tests connected to a load bank. None have been connected to the grid. The Guard, getting anxious, has renegotiated SheerWind’s contract to $675,000 for the three devices. They expect all units to be operational by late spring or early summer. “We and our lawyers have held them accountable,” says Brig. General Stone. “The government is not paying for the extra costs” to get the units operating. The Guard appears to be keeping its powder dry as SheerWind’s project lurches toward default. The project at Fort Custer “will either be a spectacular story or a monumental failure,” warns Stone. The three units are unlikely to operate. If they do, their performance will be so poor that the Guard will likely abandon the devices in a matter of months. The question then becomes who will pay to remove the devices, the Guard or SheerWind, or will the devices stand idle for years to come as a monument to hubris. The Nature Conservancy, the municipality of Slagelse, and the Michigan National Guard all fell prey to a particular pitch. The devices won’t kill birds. The devices can be installed in urban areas. Or that getting planning approval for the devices will be easier than that for conventional wind turbines. Yet SheerWind provided no evidence that any of these claims were true. But nowhere were the claims more outlandish than the claims of how much electricity these mysterious devices would produce. Either in one of the wind industry’s most egregious errors or in a deliberate attempt to deceive users, SheerWind posts energy production numbers not obtainable in the real world. With ducted turbines this is of itself not so unusual. That’s par for the course. What is different is SheerWind’s, shall we say, sheer audacity. Let’s take the spec sheet for their “2 kW” version. (They have models into the MW class.) SheerWind says this device will reach 2 kW at 12 m/s. Disregard whether it can do this or not. What we want to know is what this turbine will generate in kWh. In the end, that’s all that matters. SheerWind says that the AEP (the Annual Energy Production) for this device is 17,520 kWh per year at a wind speed of 12 m/s. If you know anything about wind energy that number will strike you as way off the mark. So you begin wondering how they get this value. Therein is the sleight of hand. SheerWind labels an accompanying chart “Annual Energy Production” like charts found for conventional wind turbines. These charts show how much electricity the wind turbine will produce per year at an average annual wind speed. However, SheerWind adds a few other words to their title that changes the entire meaning. SheerWind’s chart shows “Annual Energy Production at Fixed Wind Speed.” Sounds similar doesn’t it? It’s not—by a long shot. The wind varies in strength from one moment to the next. It’s not constant—or “fixed” in the vernacular of SheerWind. When meteorologists describe the wind they say the measured speed was instantaneous or it was averaged over some period of time, seconds, minutes, or years. When we want to know how much energy a wind turbine will produce, we use the average annual wind speed. That tells everyone that the number is an average of many varying wind speeds over that period of time. Saying a wind speed is an average is an important signal, because the power in the wind—and hence the energy—is a function of the cube of the speed. And, while it’s not apparent, the sum of the cubes of varying wind speeds is not the same as the cube of the wind speed. Thus, meteorologists and wind engineers use standardized distributions of wind speeds over time to characterize the wind in a standardized way so they can compare the generation from one wind turbine to the next—to compare apples to apples. The result is called the Annual Energy Production or AEP. There is no such thing as the “Annual Energy Production at Fixed Wind Speed” in the field of wind energy. This is a concoction of SheerWind. It makes no sense. Worse, it’s deceptive. SheerWind says their device will reach 2 kW at 12 m/s and it will generate 17,520 kWh at a “Fixed Wind Speed” of 12 m/s. What they are saying is that their device if operated 8,760 hours per year at 2 kW it will generate 17,520 kWh (8,760 hrs/yr x 2 kW = 17,520 kWh/yr). No wind turbine has ever operated 100% of the time at its rated power. None. The chart and SheerWind’s AEP estimates are misleading because they use standardized technical terms to mean something they do not. They’ve created their own alternative facts—a common problem today--but they use common industry words to describe them. Beyond their misuse of these technical terms, there is SheerWind’s choice to highlight a wind speed of 12 m/s. There are very few places—if any—in the world with an annual average wind speed of 12 m/s. On their 2 kW model, the intake is 4 meters in diameter. If the intake on this device is comparable to what SheerWind has published in a scientific journal it would be about 2 meters in height. Thus, the area of the intake is 8 m². For a conventional small wind turbine sweeping the same area as the intake on this model Invelox, the turbine would generate about 4,000 kWh at an average annual wind speed of 6.5 m/s. If, for some reason, this device performed as well as a modern conventional wind turbine you might get 8,000 kWh per year. If you installed one of their “200 kW” models, simply multiply everything here by 100. Unfortunately, it gets worse. SheerWind’s 2 kW model is “upgradeable” to 4.4 kW. And, yes, you then get more than double the energy production: 38,000 kWh. How they do this is never explained. Their 200 kW model is upgradable to 1,000 kW and accordingly will generate 9 million kWh per year. What a deal. Who could refuse? As the Nature Conservancy and the city of Slagelse learned the hard way, SheerWind’s devices don’t work. And if they ever do work—that remains a very big if—the Michigan National Guard will find that the devices will not generate anywhere near the amount of electricity they expect—even with the revised contract. Carl Sagan’s demand for extraordinary proof of extraordinary claims requires that ducted wind turbines offer measurably significant advantages over conventional wind turbines or there’s really no point in using them. Each additional ducted turbine promoter that fails drives another nail into the technology’s coffin. For with each failure, the burden of proof becomes ever greater on the next inventor, as the probability of success grows exponentially smaller. The SheerWind-Invelox story will not end well. SheerWind will have to run faster and faster to stay ahead of its failed projects. They can only do that for so long. Its day of reckoning may be near at hand. SheerWind did not return my calls or answer my email regarding their claims.